Embargoed until 00.01 Tuesday 18th September, 2012 – As the world’s leading retailers gather in London this week for this year’s World Retail Congress, retailers across Europe predict the mobile phone will overtake the physical store, website and call centre, as the single most important communication channel with customers by 2020, according to new research from MasterCard. 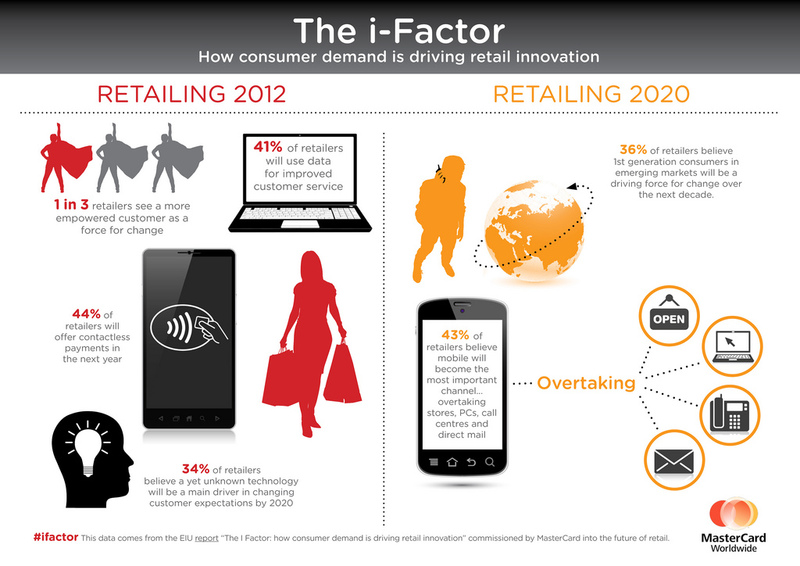 However, only 3% believe the industry is currently keeping pace with consumer demands for multi-channel retail. This research, conducted amongst 300 leading retailers across Europe, forms part of a new industry report sponsored by MasterCard and written by the Economist Intelligence Unit: “The I Factor: how consumer demand is driving retail innovation”. It heralds the era of the “I-Con” – the smart, omnichannel, omnipotent consumer – and looks at how retailers are innovating to retain competitive edge in a rapidly revolutionised market, whilst setting out a vision of how that market will continue to evolve. The high street remains, the future is omnichannel: whilst short-term retail investment may focus on enhancing e and m commerce offers, they will aim to revolutionise their in-store service provision in the longer-term, providing a seamless service across all channels. 41% of retailers envisage they will provide mobile points-of-sale in-store by 2020, whilst 33% will provide self-service kiosks and 35% will use location-based technologies to attract new sales. Hany Fam, President of Strategic Alliances Europe, MasterCard Worldwide, says: “This is a hugely exciting time for the retail industry. Technological innovations have been transforming the sector, allowing retailers to extend their market share beyond their backyard and beyond borders. In June and July, on behalf of MasterCard, the Economist Intelligence Unit surveyed 306 European retailers to investigate their views on the challenges and opportunities for the retail industry in the years to 2020. Respondents were drawn from the UK, France, Germany, Russia and Italy. Retailers were grouped by type: including independent retailers, department stores, supermarkets, specialty retailers and chains. They were also grouped by size (annual revenues of less than €500m and greater than €500m). “In a lot of organisations there’s internal resistance to change. We have tried to take a view that if it’s right for the customer it will be right for us eventually”. “The reality is that you’re competing with Amazon, whose operating profits are between 1% and 3%. The competitive dynamics have moved significantly. You have to be as good as Amazon online and offer the same amazing experience as you do offline”.